The late ascent was due to the flu epidemic. But it was also partly calculation. At the top summit days between 26 and 28 September, there was such a “cattle drive” that we certainly wouldn’t have had any fun if we were forced to participate. Fortunately, however, the weather remained stable for a very long time. I was told that last year there had been two possible summit days. This time we had a long good weather window of two weeks. We had positioned ourselves far back, what in the end was good luck. We got free range, there were hardly any people left. Last Saturday, 30 September, was a good summit day. In the morning it was still a bit windy, so we did not set off before 4.30 a.m. But already on the first plateau the wind was blowing only with 15, 20 km/h. Besides us, there were only about half a dozen climbers, a few Spaniards and Russians. Due to the great amount of mountaineers before, the track was very well beaten. 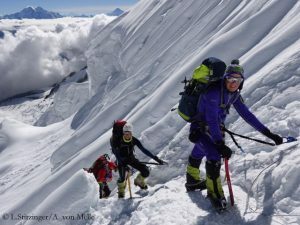 At the beginning of the season, a rope fixing team of the operator Seven Summit Treks had secured the key passages of the route up to the summit. Therefore the ascent to the summit was for us quite relaxed and due, to the weather, even a real pleasure. All of your team ascended without bottled oxygen. This seems to have become the exception on Manaslu. 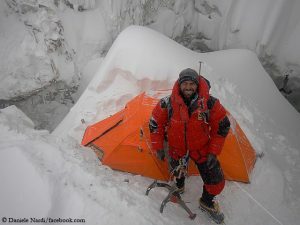 We were already on Manaslu in spring 2012. Then most were climbing without supplemental oxygen. This was quite different now in fall 2017. Three quarters of the climbers, if not even more, were using bottled oxygen. 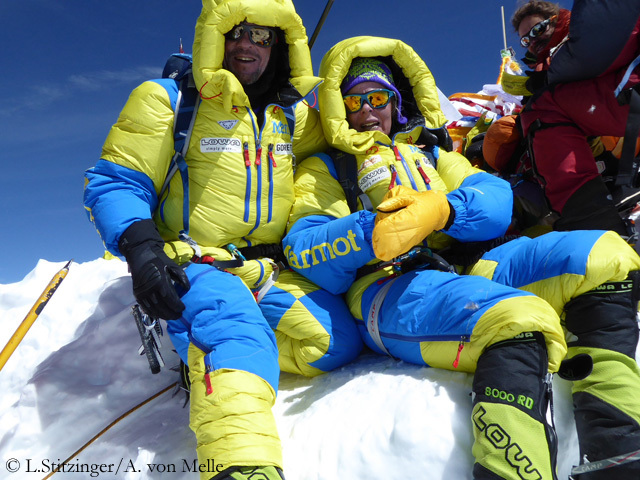 We were a little bit shocked to see people who climbed with breathing mask already above Camp 1 (at 5,700 meters). I’ve even seen people descending with oxygen from Camp 1 to Base Camp. There is a new type of expedition clients on the road. There were a lot of Chinese mountaineers who did not spare neither cost nor effort to get to the summit. Or Russian operators who did everything in a big way: partly two Climbing Sherpas per client, bottled oxygen above Camp 1, and also during the night. There is a different wind blowing. This huge mass of climbers on a mountain, such as Everest, Cho Oyu or now on Manaslu, also leads to a de-personalization of the whole thing. Twice equipment was stolen from our tents. 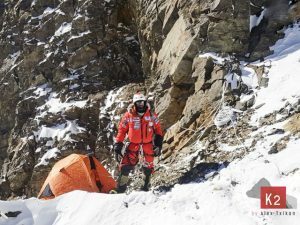 If someone steals crampons from high camp, it must be clear to him that for the victim of the theft the ascent is over, at least for that day. I find that very annoying. This sounds almost like a description of the excesses on Everest. I would say that Manaslu is the new Everest. This is not exaggerated. 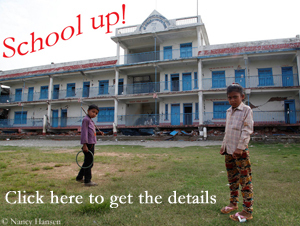 Of course, it is also because Tibet was closed this fall season. But I believe that many operators, who are offering this luxury version, have discovered Manaslu as a supposedly easy eight-thousander. Was there any agreement between the operators, who is climbing when to avoid traffic jams on the route? No, I did not know about it. They have simply chosen the best day and set off. Especially on these peak days there were a lot of traffic jams, in particular on the difficult passages between Camp 1 and 2 as well as between Camp 3 and 4. That reminded me of the pictures from Everest. I believe there were problems and displeasure among those who were not able to move forward because of the slow groups. Against this background it was good fortune that there was a lower risk of avalanches this fall. There was almost no danger of avalanches this fall. It was snowing heavily only once or twice, but the fresh snow compacted immediately. 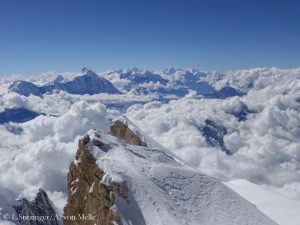 Lately, there have been reports from mountaineers that the effects of climate change can also be seen clearly on Manaslu. You were already there in 2012. Can you confirm this impression? In 2012, we were on Manaslu in spring, when the snow of winter was still there, now in fall, so this cannot be compared. But you can see that the glacier is retreating. On Manaslu North, for example, there are a lot of rocky spots where, a few years ago, still were complete ice slopes. Everywhere water is running. 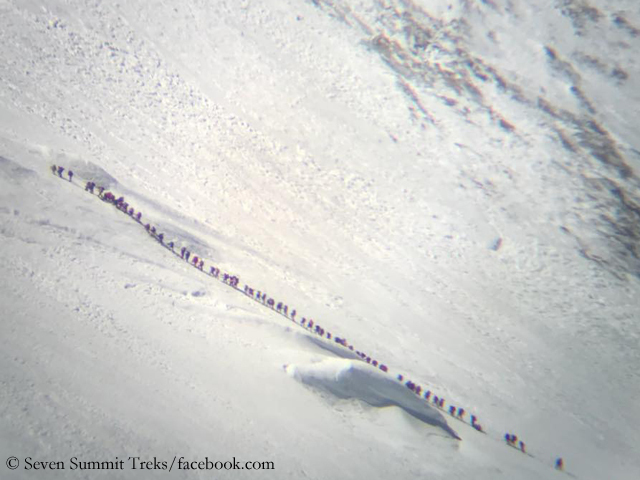 You can clearly see the effects of climate change on Manaslu.